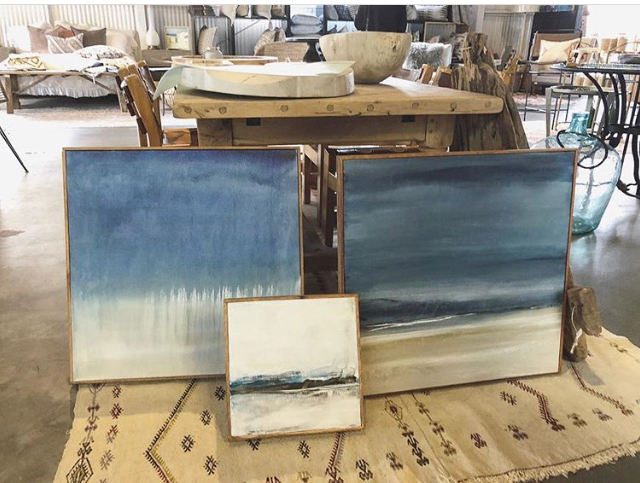 Nancy Fraser, a resident of North County San Diego for over 20 years, started painting at a very young age. She continued her studies at the University of San Diego with an emphasis on painting and drawing, supplementing her study of art abroad in Aix En Provence, France. Living in Cardiff by the Sea for most of her adult life, Nancy is inspired by our beautiful California Coast. She prefers a modern edge on a traditional landscape using a minimalistic approach. As an artist, Nancy's intentions are to invite the viewer into the same tranquil place that the sea provides for her. "There is a certain mindfulness when I spend time near the ocean, through my artwork, I hope to create that same internal and external experience for my viewers. Nancy also specializes in working directly with designers, to create a particular piece for a particular space. She enjoys collaborating with internal designers, using their vision to create a piece of any size, color pallet and look they need for an interior space. Copyright © 2019 Nancy Fraser Fine Art. All rights reserved.